Here is a summary of the DNA Lecture schedule for this year's GGI2019 Belfast. The event is being held as part of Back to Our Past at the Waterfront Centre in Belfast on Feb 15-16. Below is a summary of each talk. DNA testing is an essential tool for the family historian and has the potential to provide answers which can’t be found from the paper trail alone. The large genetic genealogy databases are helping to reunite long lost cousins and break down long-standing brick walls. But if you’ve not yet tested it can be very confusing trying to decide how a DNA test can help with your research and working out which test you should be taking. Come and learn about the three different tests – Y-chromosome DNA, mitochondrial and autosomal DNA – and how you can apply them to your research. The talk will be illustrated with case studies and some inspiring real-life stories. Due to the promotion of DNA testing by the North of Ireland Family History Society and ISOGG, many people within the nine counties of Ulster have now tested their DNA and more are testing all the time. This provides people throughout the world with a better chance of finding relatives of their North of Ireland ancestors. This talk gives tips and advice on how best to maximise your chances of using your DNA results to find relatives of those elusive Irish ancestors. Uploading your DNA to other sites, using chromosome browsers and joining projects will help you in ways that Ancestry DNA can't. Since the Scottish DNA Project began in 2001 there has been significant growth in Y-DNA participation. It is now generally accepted that Y-DNA testing may present objective evidence to resolve genealogical questions and challenge received understanding. Scottish Clans descend from a variety of peoples, including Pict, Briton, Irish, Angle and Norse. To what extent do we know the genetic signature of lineages from these peoples? Alasdair will discuss how advances in technology have helped us understand the origin and inter-relatedness of many Scottish Clans. The presentation will include discussion on research strategies, the limitations of current testing and include case studies detailing recent findings on the medieval origins of a number of Clans and families. y-DNA tests enable the exploration of the origins and diaspora of surnames. James Irvine has administered the Irwin surname project, now with nearly 500 members, since its foundation in 2005. He will draw on this experience, and on other surname projects, to show how raw y-DNA test results can be enhanced using various tools, both on-line and “do-it-yourself”. Using actual examples he will show how to identify Matches, how genetic distances can be both helpful and misleading, how STR test results can be grouped into genetic families, and how to calculate TMRCAs using both STRs and Big Y SNPs. Jonny Perl will give an overview of how the DNA Painter website can help you understand how you might be related to the people who appear on your list of DNA matches. A brief introduction to chromosome mapping will be provided, along with background on the process and limitations of predicting relationships based on the amount of shared DNA shared. This talk is suitable for both beginners and more experienced researchers who are curious about these topics. This presentation reports some of the findings of the Double-Helix History project which has been talking to family historians around the world about their experiences of genetic genealogy and the impact on their work of the new DNA information that is available. Presenting information from the USA, Australia, South Korea, Japan and the Netherlands, the talk will look at the ways in which family historians around the world are grappling with the new challenges - and opportunities - that genetic genealogy is opening up for them. Our DNA matches have been rapidly increasing. We are uploading to other sites, testing more of our family, and getting more matches as the databases grow. It's all good news, but we need to be able to manage all these matches to get the maximum benefit from our DNA test. This talk will look at the increasing database sizes, how we can upload to other sites for more matches, and then how to manage all our information. We will look at the tools on the test site that help us manage matches, and also how to use other tools like spreadsheets, DNA Painter, and even our own family tree to keep all our information in order. 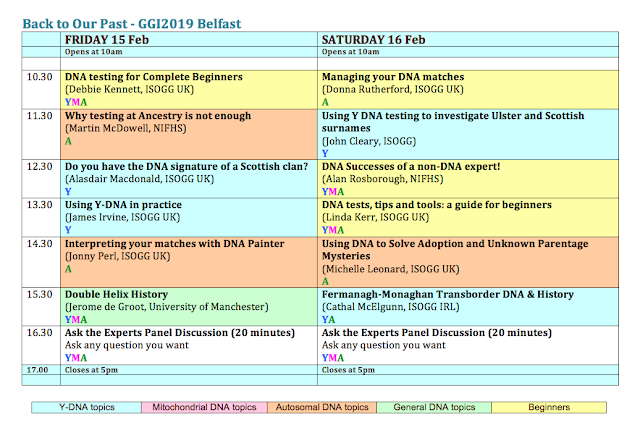 This talk presents an overview of the best ways to use Y-DNA testing to research the origins of surnames in Ulster, and the best strategies for applying DNA evidence. DNA is just one form of evidence that needs to be used in tandem with other types of genealogical evidence for best results. This will be explored with examples of projects for surnames with possible Scottish origins such as Orr, Cochrane, Cummings and Kemp. Genealogy is like the board game Cluedo! The characters are all gathered together, the murder weapons are placed in the rooms and the game begins with a roll of the dice. But who can solve the mystery? In the same way we carry out genealogy research trying to build a family tree or solve the family mysteries by gathering the clues, and when we have enough evidence, we try and come to conclusions and make the links or solve the mystery. But sometimes it is only when we open those DNA results that we can truly say we got the research right. Hear how some genealogy mystery stories were finally solved and how DNA has helped. This talk is aimed at beginners and will cover the three main tests and some of the current tools that can help you to find lost ancestors and unknown cousins. Find out what each test can tell you and what you can do with your test results. Using examples from her own research, Linda will show how DNA testing can extend your family tree and how it works alongside your documentary research. There are some mysteries traditional research can never solve but DNA has revolutionised the options available to adoptees and those with unknown parentage. This talk will explain how to use DNA testing to solve previously unsolvable mysteries. Michelle will illustrate the entire process from choosing the correct tests through to making contact with new close relatives. Using case studies she will outline how to combine DNA cousin matching with traditional research when you have no known family history to draw upon and give a practical demonstration of the most important techniques required for successfully identifying birth parents or other unknown ancestors. The transborder region of Fermanagh and Monaghan has had a lot of mixing of DNA over the centuries. This talk examines the ancient history of the area and links this to Y-chromosomal signatures in the present. It also looks at the local autosomal matches seen for a number of local datasets on GEDMatch and elaborates on how autosomal and Y signature similarity can be used to prove the historical record and vice versa. Will any be on podcast? We will record the lectures for the YouTube channel ... see link at top right.